Posted on Wed, Jan 26, 2011 : 10:39 a.m. It's an important week for three strong contenders for various national college basketball player of the year awards. 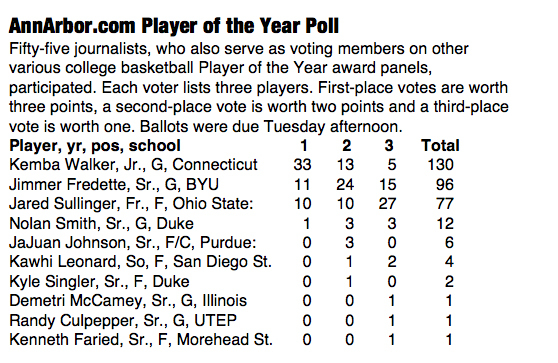 Connecticut junior guard Kemba Walker, BYU senior guard Jimmer Fredette and Ohio State freshman forward Jared Sullinger — the top three vote-getters in the second AnnArbor.com College Basketball Player of the Year poll — all had big tests within 24 hours of each other. Walker and Sullinger played Tuesday night. Fredette gets the national stage tonight when BYU plays undefeated San Diego State at 10 p.m. (CBS College Sports). Walker showed up on 51 of the 55 ballots submitted by Naismith, Wooden, AP and Robertson voters by Tuesday night, asking for their top three candidates in order. Fredette was on 50 ballots. Walker also led the first poll of the season. Walker showed he’s more than just a scorer and that Connecticut is more than merely Walker. In a 76-68 win at Marquette, the nation’s second-leading scorer had 14 points, nine assists and six rebounds. He's also always been a good defender. Meanwhile, at the same time, Sullinger and top-ranked Ohio State dismantled Purdue, 87-64, and its All-America candidate, JaJuan Johnson. Sullinger scored 17 points and had seven rebounds, and he was efficient with 7-of-12 shooting and had two 3-pointers. Johnson, another Player of the Year candidate, had 22 points and seven rebounds. Sullinger’s performance came after a 27-point, 16-rebound game against Illinois on Saturday. Tonight, Fredette and No. 9 BYU play No. 4 San Diego State. It is one of the first times this season the country will see Fredette after he made a name for himself last year entering the NCAA tournament. It’ll help, too, that Fredette will face another potential Player of the Year candidate in San Diego State sophomore Kawhi Leonard. But a big game from Fredette — the nation’s leading scorer at 26.7 points per game — and a lot of people will notice. For the second straight poll, there were 55 voters, tying the most in the three-year history of the poll. Ten players were named to the second poll, a drop from the 13 in the first poll. There was one newcomer to this poll, Randy Culpepper from UTEP. Four players dropped from the initial poll: Purdue guard E’Twaun Moore, Wisconsin forward Jon Leuer, Syracuse forward Rick Jackson and Maryland forward Jordan Williams. Six conferences represented the 10 players: Big Ten, Big East, ACC, Mountain West, Conference USA and Ohio Valley. The Big Ten had the most players listed, with three. Only one school, Duke, had multiple players listed. Although Kemba Walker received more points this poll, his lead shrunk from 40 points in the first poll to 34 in the second. Jimmer Fredette made the biggest jump from the first poll to the second poll, moving from third to second and jumping from 56 points and 6 first-place votes to 96 points and 11 first-place votes. The Duke players made the biggest drop in the poll. Nolan Smith remained in fourth place but his points dropped from 26 and three first-place votes to 12 and one first-place vote. Kyle Singler received 18 points and three first-place votes in the first poll. In the second, he received one second place vote, good for two points. Thu, Jan 27, 2011 : 12:37 a.m. Funny how our staff says we can not win we are young and Thad at OSU brings out his freshman and he is possible player of the year nationally. Something is lacking in the recruiting by our current staff. Time for Mr. Brandon to jet set around the country.